Finding notes on your guitar is not the same as reading notes on sheet music. To understand how to find notes on a guitar, it helps to break up the neck of the guitar to see where all the notes lie. 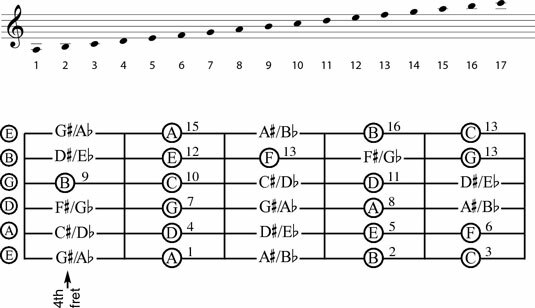 The trouble with laying out the neck of a guitar against musical notation is that notes repeat themselves all along the neck, and it can get confusing with so many options for playing notes in different ways. The following illustrations break the guitar neck up into three non-repeating sections to correspond along the natural notes on the staff, stopping at the 12th fret (which usually has two dots on it), also known as the octave mark. 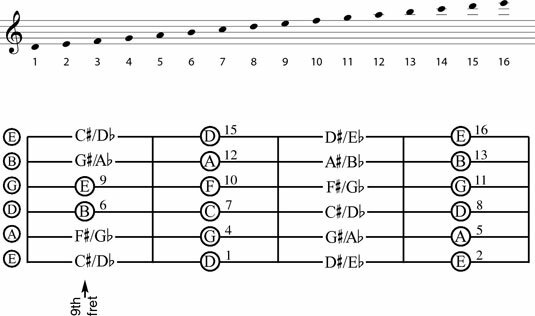 Look at where the notes fall on the first three frets of the guitar, then the next five, and then the next four. The first string position being “open,” the first four frets of the guitar neck are shown. 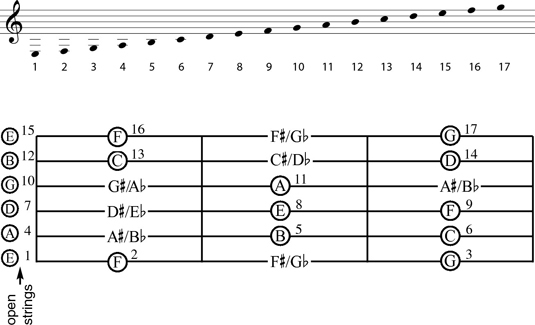 The notes of the fourth through eighth frets. The notes of the ninth through the twelfth frets. Click here to download and print these diagrams. On many guitars, two dots on the twelfth fret signify the octave, meaning that it is the same note as the string played open, except one octave higher.